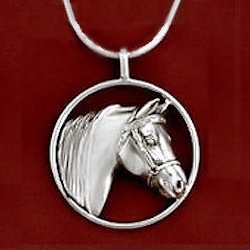 Sterling silver Morgan/Tennessee Walking horse head pendant looks best on the sterling 18′ or 20″ snake chain. Circle measures 1-1/4″ diameter. 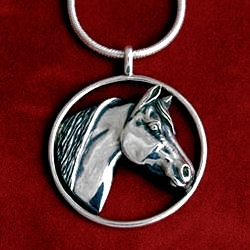 This Morgan horse necklace is shown inside a hand made circle and looks best on a 18″ or 20″ snake chain. 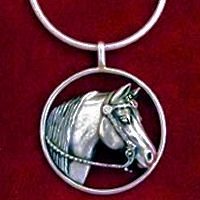 Circle measures 1-1/4″ diameter.